Sidney Slon/Staff Photographer Freshman guard Sam Sessoms went 6-for-11 from beyond the arc for a total of 22 points in Binghamton’s blown game against Morgan State. 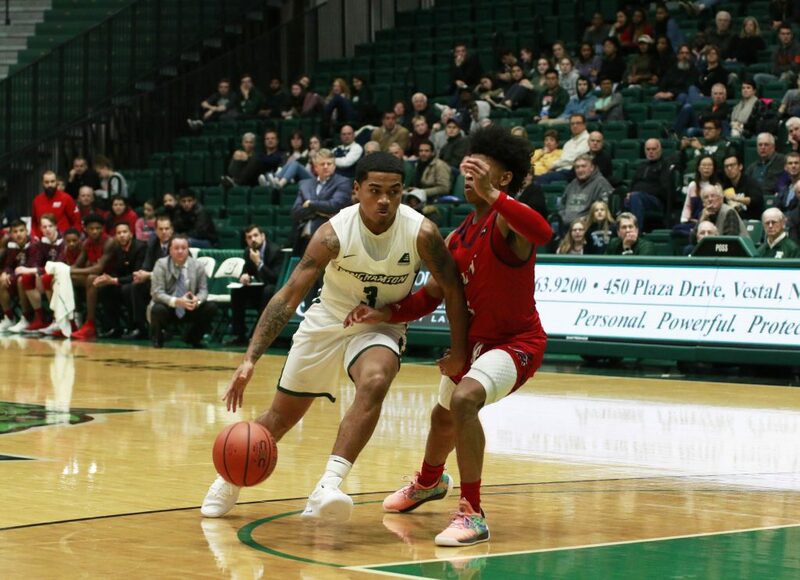 As the clock was ticking down in the first half, senior guard Timmy Rose stepped back and drilled a three from the corner, just beating the buzzer, and the Binghamton men’s basketball team took a 44-28 lead into the locker room at halftime. A 4-0 start to the second half gave the Bearcats a 48-28 margin, but it would not hold. A 32-10 run gave Morgan State a 60-58 edge, a lead that held for the remainder of the game. The Bearcats (3-6) could not regain the lead, falling 74-68 to the Bears (3-5). It was a bitter ending to a game that started so prominently for the Bearcats. BU was outscored 46-24 in the second 20 minutes, struggling mightily on both sides of the ball. After shooting over 50 percent on 3-pointers in the first half, the team was just 2-11 in the second, with both being hit by freshman guard Sam Sessoms in the final two minutes. Foul trouble plagued the Bearcats for the entirety of the second half. With 3:29 remaining in the game, graduate student forward Chancellor Barnard fouled out, and just over 30 seconds later, freshman forward Calistus Anyichie did the same. Both were on and off of the court throughout the entirety of the period. Sessoms once again led the Bearcats in scoring with 22 points. Graduate student guard J.C. Show pitched in 19 points and eight rebounds. For Morgan State, freshman guard Sherwyn Devonish-Prince Jr. and redshirt junior forward Jordan Little both led the Bears with 14 points each. Last season, Binghamton and Morgan State kicked off their seasons with a matchup against each other in the Events Center. BU prevailed in a dominant 76-59 victory, with four Bearcats finishing the game in double-digit point totals. The Bearcats are now more than halfway through their nonconference season, and they sit below .500, with only one win against a Division I opponent and no road victories. This year’s nonconference slate has been tougher than previous seasons, but the struggles against their opponents thus far have to be objectively concerning for Dempsey’s squad. With the contests only getting tougher, the team must improve itself in order to better prepare for the conference season, which sits just a month away. This Saturday, the Bearcats will return home for their next game against Loyola Maryland. Tipoff is set for 2:30 p.m. from the Events Center in Vestal, New York.